I’m doing it! Come see me and others, including comedian, Michael Capozzola…if you dare (or if you just love good stories about food). Mine will be about my 5 moms and coffee! Studio Gourmet is quickly becoming the hot foodie ticket in town. Founder and host, Brad Lev, takes us into an intimate space with some of the best chefs in San Francisco. Next up is “bad boy” Chef Russell Jackson from Lafitte on Sunday, Feb 20, 2011 at Horatius in Potrero Hill. If you love the San Francisco food scene, then you know Russell Jackson (or at least you might think you do). Pirate chef, notorious, Zeus of the underground dining scene? Perhaps?! I was very glad to attend the inaugural event featuring the very talented and charming, Chef Martin Brock of Gary Danko (Chef de Cuisine). I’m not sure what I liked more: hearing about him growing up on a farm in Germany; when he received “the call” from Gary Danko himself; or about life as a newlywed. The conversation was great and the food was amazing! Yes, you get food :0). As a coffee lover, there’s nothing like opening a bag of amazing whole beans and taking a long, deep breath! That being said, I was so happy to stumble upon Marley Coffee. My husband is a huge reggae fan, so of course, Bob Marley is king. How do you combine his love of reggae and my obsession with good coffee? Marley Coffee. Yes, this is the real deal, founded by Bob Marley’s son, Rohan. Guess who is going to be video chatting with one of the biggest chefs in America?!!! I cannot tell you who it is yet, but let’s just say that if your watch Food on TV, you will know and love this person! We’ll be releasing a series of short video conversations, so let me know what I should ask? It’s a well-known fact that San Francisco is famous for it’s Dungeness Crab. Each year, between mid-November and June, you will find countless amounts of fresh crabs at the Wharf and in the best of restaurants in town. Now, the past couple of years have been really tough, but the 2010/2011 season is looking pretty epic! You can find crabs at local markets for as cheap at $3.99/pound. Awesome! Every year, I get invited over to my friend’s house for a crab feast. It’s tradition and her dad, Nick, has been steaming crabs for a long, long time! Here’s a sneak peek at all the fun we had and check out the full recipe below. Allow yourself the ability to maximize the crab-eating experience by using all of your senses and making your own crab dinner! Invite a few friends over and follow the delicious and simple recipe below for a night of good conversation, messy eating and the freshest crab around. Go to the market (Asian markets are great for crab) and buy 8 live 1-2 pound Dungeness Crabs (serves 4-6 people). It is crucial that the crabs are live and active when you buy them. Add 3-inches of water to a seafood steam pot (16-quart used in this recipe), 6 ounces of vinegar, 10 dried chiles crushed by hand (or Mexican hot sauce), and 4 ounces of Old Bay Spice or Susan’s Seafood Seasoning. 1. Bring to a steaming boil and then put half of crabs into the pot. Cover with lid. Do not remove lid for 5 minutes. Special thanks to Nick Mamczak! Nick Mamczak is a fantastic cook, classically trained at the Culinary Institute of America. This recipe was inspired by his love of seafood. The Oyster & Bacon Stuffing was a huge huge hit (I used smoked oysters) and I was happy with the rest of the menu too. But, I have to tell you that the damn turkey almost gave me a heart attack! They only had frozen turkeys when I went to the supermarket late the night before and I was stressed about defrosting it. Then, when roasting, I had a leak in the cheapie pan that I used and the oven started smoking. Next, I was worried about opening and closing the oven too many times while cooking the side dishes. 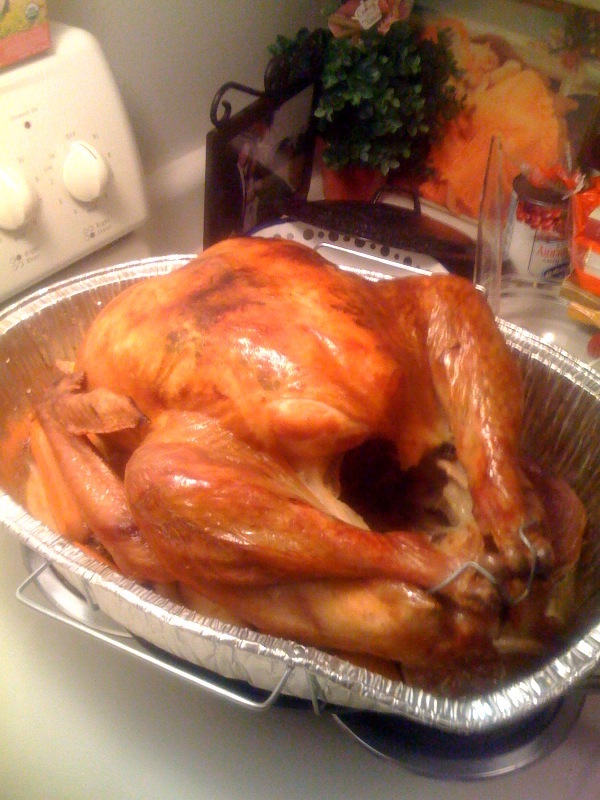 Finally, after about 4 hours, it started to look like a cooked turkey. But like most new cooks, I still stressed over possibly poisoning my family and neighbor with an undercooked bird, so I dug into the drawer for my 2 fancy meat thermometers – all this while I cleaned the kitchen, vacuumed, and set the table with fancy things. Our only guest this evening, my lovely neighbor, arrived punctually and after a few minutes of watching me try to put a battery into the fancy meat thermometer, she offered some help. She set the thermometer aside and grabbed a fork. With a couple of pokes, she says, “oh, it’s done!” in her New York Italian accent. She had 79 years of cooking wisdom behind her, so I took her word for it! Thankfully, it turned out pretty good and with good wine and great conversation, I’ll call it a hit! I hope you all had a great Thanksgiving. Happy Holidays!